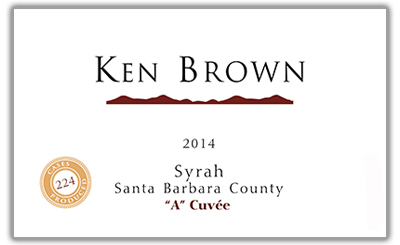 LIBRARY WINE Ken's signature "A" Cuvée blend of cool and warm climate Syrah. Vibrant aromas of plum, blackberry and violets. This wine is one of Ken’s signature Syrahs in which he has expertly blended warmer climate and cooler climate Syrah for a superbly integrated and balanced wine. Rich aromatics of Santa Rosa plum, blackberry and currant mingle with a hint of earthiness, pink peppercorn and violets. Vibrant flavors of dark plum accented by subtle notes of roasted meat and anise are enveloped in a rich, luscious mouthfeel. Velvety tannins beautifully bridge the wine from beginning to end, culminating in a long finish. The plush texture and layers of complexity will only be enhanced with additional time in the cellar. 50% McGinley Vineyard (Santa Ynez Valley), 30% Watch Hill Vineyard and 20% Thompson Vineyard (Los Alamos Valley). McGinley Vineyard is located in the Happy Canyon AVA of eastern Santa Ynez Valley, a traditional Syrah-growing zone that enjoys a relatively warm microclimate due to its inland position. By contrast, Thompson and Watch Hill vineyards are moderately cool sites, located in the Los Alamos Valley in closer proximity to the coast where cool days and nights prevail. The 2014 vintage made history as the earliest harvest on record in Santa Barbara County. It was also the shortest in duration, commencing on August 25 and concluding just 32 days later. The growing season began with a very mild winter and below average rainfall for the third year in a row. Budbreak occurred in early March followed by warm, even temperatures throughout the spring and summer. Yields were a touch above average in most vineyards, though slightly lower than 2013. Grapes from the three vineyards were harvested between September 12 and September 26. This Syrah was crafted using an adaptation of Australian winemaking techniques focused on extraction early in the fermentation process, minimizing the risk of harsh tannins. The grapes were crushed into tanks and given a four-day cold soak. At the conclusion of fermentation, the lots were pressed immediately and aged separately for 10 months in French oak barrels with 31% new oak in the mix. The lots were then blended and bottled on August 13, 2015.